President Abdulla Yameen has congratulated the Maldives national football team on winning SAFF Suzuki Cup 2018 after beating India in finals. Almost immediately after the Maldives national team emerged as champions of SAFF Suzuki Cup after beating neighboring India 2 - 1, president Abdulla Yameen phoned the team's captain Akram Abdul Ghanee to congratulate the team. 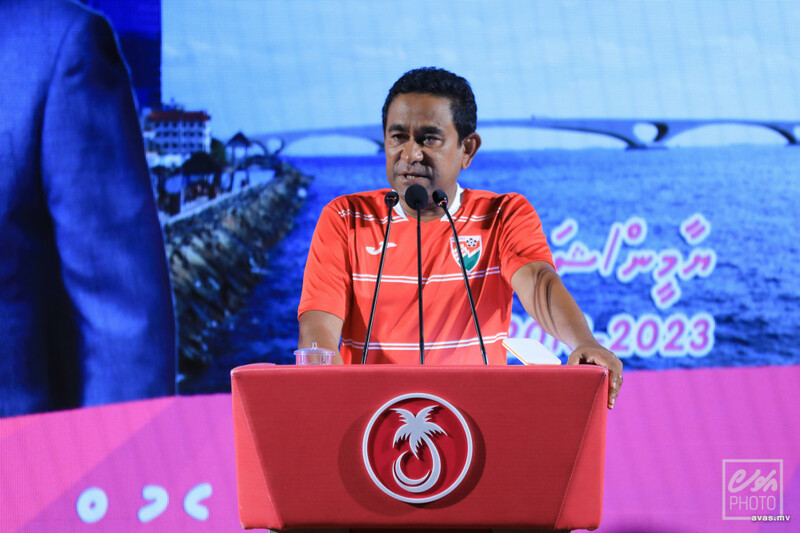 While extending his felicitations, president Abdulla Yameen noted the team's victory on Saturday night comes as a great moment of pride for the Maldivians in after years. The Maldives head of state had congratulated the entire national football team for their hard work and efforts, and winning the championship title. President Abdulla Yameen had praised the performance of the entire squad but noted few issues of fatigue by the players. Upon the team captain's assurance of improving the issue, president Yameen confirmed he had not doubt in the national team captain's efforts. The national team captain expressed his joy in president Abdulla Yameen's personal phone call congratulating the team.